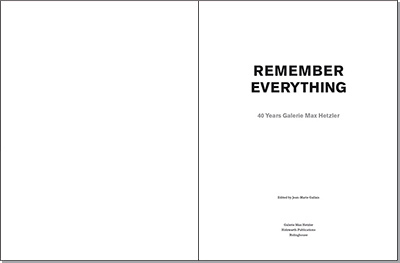 Aus Anlass des 40-jährigen Bestehens der Galerie Max Hetzler vereint die Gruppenausstellung Remember Everything aktuelle Arbeiten von 21 Künstlern, die durch die Galerie derzeit vertreten werden. Die Dokumentation dieser Ausstellung ist aber nur der Grundstein für dieses Buch, erweitert durch Interviews mit den Künstlern, die an ihre Zeit mit der Galerie und ihre dort ausgestellten Arbeiten zurückdenken. Der einleitende Essay und eine ausführlich bebilderte Chronologie erzählen die ganze Geschichte der Galerie Max Hetzler von den Anfängen in Stuttgart über Köln nach Berlin, die durch das beeindruckende Aufgebot der vielen international bedeutenden Galeriekünstler zu einem Teil der Geschichte der zeitgenössischen Kunst geworden ist. If there is a single lesson to be learned from the first twenty years of Galerie Max Hetzler, the “before-Berlin-era,” it is the answer Max invariably gives the journalists when they ask him, as they often do, what his guiding vision is: “The program is the artists.” And this was no doubt even more relevant for the following twenty years: it was in Berlin that the current Galerie Max Hetzler took shape. Chronology becomes more vague and porous. Günther Förg, Albert Oehlen, Jeff Koons, Thomas Struth, and Christopher Wool were still shown in Berlin as they were in Cologne, and did important exhibitions here. Over the next few years, Samia and Max had determining encounters with those (native or adoptive) Londoners, Darren Almond, Glenn Brown, Michael Raedecker, Bridget Riley, Rebecca Warren, Toby Ziegler. It was while Rineke Dijkstra was in residence in Berlin that they made her acquaintance. Yves Oppenheim, meanwhile, left Paris permanently for the German capital. In an exhibition curated by Sarah Morris in 1997, Hospital, they met Darren Almond but also Richard Phillips, with whom they began to work. Glenn Brown had a first solo show in 2000; Vera Lutter in 2002. In the early years of the new millennium, Max also took an interest in the painting of German artist Frank Nitsche, and in that of André Butzer. Then he traveled with his very close friend, “the publisher” (Max so designated him in a chronicle he wrote once for a magazine), and in Brazil they came across Beatriz Milhazes, Ernesto Neto, and Marepe. In 2005, during an exhibition of drawings and works on paper, Samia invited Mona Hatoum, who subsequently had three exhibitions at the gallery. In 2007, they began to work with an artist that they had long admired, Bridget Riley, who made her first wall painting in the gallery on this occasion. Just before, Rebecca Warren had presented her work there for the first time; Toby Ziegler and Michael Raedecker followed with solo exhibitions in the past five years. 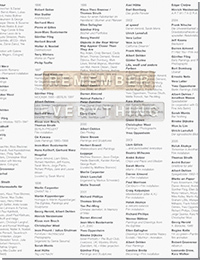 All these marvelous and brilliant artists have made Remember Everything. It is these artists who are the substance of the exhibition, of this book, and of the Galerie Max Hetzler. The story of the Galerie Max Hetzler is the story of a little legend unwilling so to conceive itself. This book has not been made in order to glorify it but to give an account of what has happened.